Yesterday at flog this dead brewing we made an American pale ale (definition here). And, for the first time ever in our brewing history, we made a 10 gallon batch of beer. 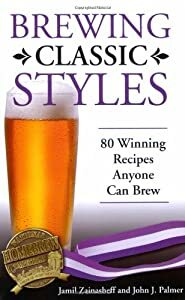 The recipe came from the book, “Brewing Classic Styles: 80 Winning Recipes Anyone Can Brew” by Jamil Zainasheff and John Palmer. If you don’t have this book in your library, you should. 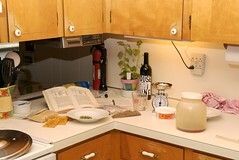 The recipes are designed for extract brewers, and also have the recipe for all grain brewers. We needed to slightly modify the grain bill for Jamil’s American pale ale by replacing the Munich malt with 1.75 pounds of Vienna malt. The rest was 23 pounds of 2 row barley malt and 1.25 pounds of white wheat malt. The hop schedule for this one was 1.25 ounces of Galaxy hops at 60 min. (we had no Horizon hops in stock), 1 ounce of Cascade hops at 10 min., 1 ounce of Centennial hops at 10 min., 1 ounce of Cascade hops at 0 min., and 1 ounce of Centennial hops at 0 min. in addition, we will dry hop with 2 ounces of Falconer’s Flight hops. In addition to this being flog this dead brewing’s 1st 10 gallon batch, it was also the 1st time we have ever fly sparged (our 15 gallon keggles could not handle that much grain and water at the same time). Perhaps it was the fly sparging for our better than 65% efficiency, but our efficiency was 73%. As a result, what should have been an original gravity of 1.056 turned onto be 1.068. Our American pale ale is in the India pale ale category at least as far as alcoholic content. The beer is now in Better Bottle fermenters (and covered with wet T-shirts to keep the beer as cool as possible under trying conditions) and merrily percolating away. The initial taste of the raw wort is of a sweet pleasantly hopped ale. We should know in a week to 10 days if this batch will be a success. I got a call from my friend Ron, the owner and head brewer, at Kelsey Creek Brewing Company the week before last. He had some American ale yeast, would I like it? Hell yes, I would like it. Getting “some yeast” from Ron is the equivalent of maybe 10 starter batches; it’s probably a pint (~0.5L) of active yeast. I wanted to make this. I really like the session beer idea where you get a lot of taste but don’t need to take a nap after two beers. Of course, I had only two ingredients of the recipe: 2-row malted barley and Munich malt. 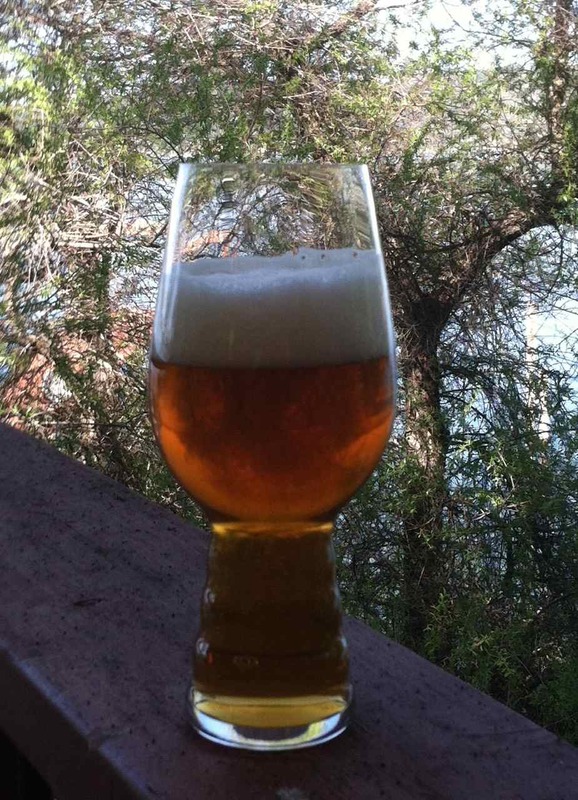 This is a picture of my Laurel IPA, but the Session IPA looks similar.. Slightly cloudy with a SRM color around 6. I brewed it on July 8 and hit the estimated numbers right on. The wort cooled and I added the yeast. Visible fermentation happened in 30-40 minutes. It started so quickly I worried that it had an infection. I covered the Better Bottle carboy with a wet t-shirt to keep it cool and closer to the optimum fermentation temperature. The coolest part of my house, the basement, was hovering around 80F during the day—too warm for something that is not supposed to be a Belgian-style beer. The specific gravity after two days in the fermenter was 1.010. It was transferred to another carboy (i.e. the secondary) and left for several more days. My beer wench (i.e. 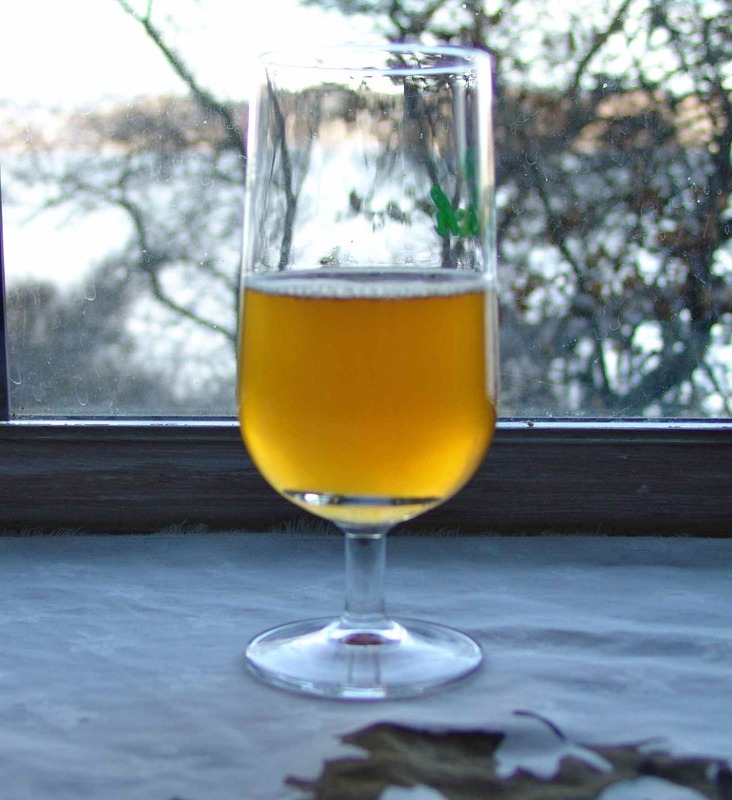 my wife) and I bottled the beer today using four ounces of corn sugar mixed with the beer to carbonate (bottle conditioning). I’m pleased with how it turned out. I give the beer 4 out of 5 stars. It tastes delightful with a citrusy hoppiness that dances on your tongue. It has a pleasant aftertaste. The mouthfeel is on the light/watery side of the scale. I would like to have a bit more fullness and maybe a little biscuit. I’ll add Victory and Vienna malts to the next batch in lieu of the corn and Crystal 60. Gary Glass, President of the American Homebrewers Association appears in this video. The video shows him pouring crushed malted grains into a plastic ice-chest and adding hot water (hot liquor in beer geek speak) to the grains and making a porridge (aka mash). There is a formula for deciding how hot (the strike temp) the water you add should be to get the desired temperature for the mash (the target mash temp is quite often ~149F-152F). After the grain(the mash) has steeped for a while (60 minutes is common), the liquid wort is drained out to be boiled. (The ice-chest has some tubing on the outside and some screening on the inside to allow the sweet wort out and keep the spent grains in.) After the wort has been captured, it is boiled (60 minutes is common) just as an extract batch would be. Last weekend I gathered some brewing gear up and headed out to show some friends how to brew beer. We were brewing a one-gallon batch of beer. If you want to try your hand at brewing beer without spending wads of cash on a five or ten gallon set-up. If you don’t want to spend wads of cash only to find you don’t like drinking five to ten gallons of the same thing. If you have an apartment with little space. If you want to experiment and not commit to five or ten gallons. We started with putting the grain (for added flavor and color) into the kit’s muslin sack and putting that in 3/4-gallons of warm (~140 – 160F) water. We steeped the bag filled with grains for 10-15 minutes and then removed it and brought the wort to a boil. Once the weak wort began to boil we added the 1-pound of NB’s dry light pilsen malt extract and the hops they provided in the kit. The boil lasted 45 minutes. Once we had a gallon of cooled wort, we added one-half package of yeast (no need for a starter with a one-gallon batch) and put the cap and air lock in place. We plan to bottle it next week. Steep grains for 10-15 minutes at ~150-160F (65-71C). Remove grain bag and bring to a boil. Once a boil has started, add hops (watch out for boil over). Boil for 60 minutes and cool. Transfer to a fermenter and add 1/2 package of yeast. Put air-lock (partially fill air-lock with water and sanitizer or vodka) or blow-off apparatus (tube on air lock opening and the other end of the tube in a jar of water and sanitizer) on the carboy and put in a cool (about 66F) and dark place for 10-14 days. Check daily to watch for over-active fermentation. 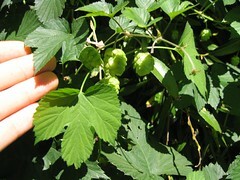 For small batches we can estimate ~0.25-0.30 ounces of pellet hops per tablespoon.